At Junxure Advisor Conference, the technology recalcitrance of firm principals kept being raised by panelists and attendees, along with strategies to get them on board. Junxure's John Haas (far left) with (from L-R), Erin Kincheloe, Troy Mertens, Rebecca Pomering and Brian Jack. When it comes to implementing new technology at an advisory firm, consultants and tech firms point out that success requires making sure you’re buying the right technology to meet your needs and that staff are adequately trained — and sometimes compensated — to make said new technology part of the firm’s workflow. However, attendees and panelists at Junxure’s third annual advisor conference agreed there’s another roadblock to tech implementation: the firm’s leadership. 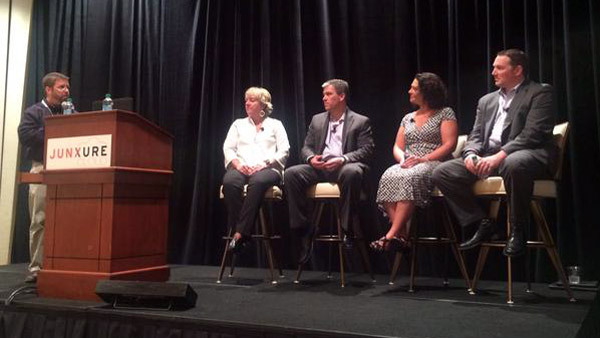 The final session at the third annual Junxure conference in Las Vegas on Friday featured a panel of advisors and consultants including Rebecca Pomering of Moss Adams Wealth Advisors, Troy Mertens of Orgel Wealth Management, Brian Jack of Budros Ruhlin & Roe and Erin Kincheloe, a former Junxure trainer and co-founder of All About It Consulting. Under the guidance of moderator John Haas, a Junxure trainer, the panelists agreed that moving from ‘adoption to implementation’ of new technology required that staff be told more than that the new software would make them more efficient. And it’s not just older people who have a hard time with implementing new technology and processes. So in the bookend session of the conference, moderator Haas asked the panel to comment on whether principals were one of the main roadblocks to implementation of new technology, like Junxure Cloud. Jack said that if “the principals don’t use it, it won’t work; you can’t implement new software or any program changes” without commitment from the top. Pomering said she has been regularly “surprised by how many founders I’ve seen who don’t use technology. They think it’s charming, but it’s irresponsible.” She said she knew of a principal in an advisory firm “who calls a friend of mine to say ‘I forgot my password to my laptop.” Pomering said of that principal, “He’s a jackass; you shouldn’t feel proud” of your technology ignorance and lack of use. Mertens urged firm leaders to introduce new technology by “talking about benefits rather than features,” citing keynote speaker Deena Katz, who used the same phrase in reference to advisors’ marketing efforts, especially in firms’ digital presence, including social media. The panelists also agreed that more than the technical staff and principals needed to be involved in the purchasing and implementation of new software. Kincheloe suggested that in any tech adoption process, include someone who might be skeptical about the technology (not hostile) to show the rest of the staff how the decision isn’t just coming from IT. Pomering seconded that idea, noting that it “gives that person more buy-in” to the decision, while Jack mentioned that every two weeks “we do a lunch-and-learn on Junxure” for staff. Jack said that at Budros, Ruhlin, “we use that exact term as well,” saying that the firm points out to staffers, especially the rainmakers, that “there are guys who do all this work but don’t put it into Junxure, so they don’t get the credit for that.” After years of encouraging use of the software, “it’s now the culture,” he said.